Chapter 12 of ‘What You See Is What You Get: My Autobiography’ by Alan Sugar (2010) is fascinating. It tells how Amstrad reinvented itself by helping Rupert Murdoch to launch Sky TV. I love stories. 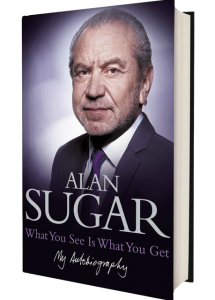 This particular story is fascinating as it shows superb lateral thinking by Alan Sugar and his team. Around 1988, satellite dishes and receivers were on the market for approximately £5,000. In June of that year, Alan Sugar agreed that Amstrad would develop satellite receiving equipment which would sell in the shops for £199. The proposition I put to Rupert Murdoch was this: “If you, Mr Murdoch, provide sixteen channels of additional television, including movie channels, news and sports, I will find a way of making satellite receiving equipment so that it can be sold in places like Dixons for a hundred and ninety-nine quid. It was my opinion that if we could achieve this, the whole thing would work. In fact, i told Rupert I was so confident about this that he didn’t need to underwrite any orders. If he would agree to press the button on renting the space on the satelite and putting up the sixteen channels, I would be prepared to start development and production at my own risk. There was no official agreement, just a handshake. His transmission date was February 1989 – my job was to make sure that we had equipment in the marketplace by then. – An Amstrad engineer designed the circuitry for the satellite receiver. Bob found a fellow who specialised in satellite tuner design – Amstrad developed Intellectual Property in this area – and outsourced manufacture of the units to Emperor Otake (a long standing supplier in Japan). – A company called Marconi provided the LNB for £28.50 based on an order for a million units. Mounted at the front of the satellite dish, the LNB (low noise block) is a device which picks up the signal from the satellite after it bounces off the dish and transfers the signal via a cable to the receiver inside the house. – The major stumbling block was the satellite dish itself. A specialist satellite dish manufacturer quoted £30 per dish. This did not fit the cost schedule at all. Look at the dish from a different perspective – it is a bit like a dustbin lid, and a steel dustbin doesn’t cost much, does it? Why don’t we find the people who bash out dustbin lids and start from there. – It transpired that the British Steel Corporation could provide blank sheets of a steel known as Stelvetite that was laminated on both sides with a rugged plastic covering for seventy pence (70p) a dish if they agreed to buy the amount of steel needed for a million of these dishes. – A company who specialised in manufacturing boots and bonnets for cars agreed to ‘bash’ out the dishes for £1. For around £3, the company also supplied the bracketry and packaging. Amstrad did not have to touch the dish – it was ready to ship. We met the £199 retail price target, but it was very tight, so we pulled our old trick – we made another receiver which included a remote control and priced it at £249. Of course, everyone went for the £249 model and we were well in the money. These were the first Free to Air satellites. The book continues the Amstrad /Sky story which includes the introduction of Decoders and Smartcards to facilitate Pay per View; and the launch of Sky Plus. I really enjoyed this book (if anyone want a loan of it please ask) and I hope you enjoyed this post. Comments welcome!